Wal Atah, was a hunter and a lovable man. Wal, meaning escape to safety, left his kin men, the current Adem community which village was originally around the NUJ area about 1868, 149 years ago. He went to settle by the rocks of Lobi Mountain overlooking the river in what later became known as the railway bridge with his wife and children. The Lobi Mountain had a thick forest with Iroko and Mahogany trees. The place was later to host the European as their quarters, and is now known as the old GRA. The trees were heaven made for carving of canoes. The Alago people from far away Loko in the present Nassarawa state used the trees for business. They would stealthy come and logged the trees down to their place. Construct canoes of them and sold same to fisher men and others people. It was a good business the Tivs knew nothing about. The canoe builders found that Wal Atah was generally good natured. He was accommodating and physically stronger than they were. He was an indigene and a hunter. This also meant that, he knew the terrain well. Atah was engaged to cut down the trees and help in rolling them to the jetty by the river bank, a job he performed with ease. He also took care of their physical needs and provided medication when they were bitten by snakes and or attacked by other beast of the forest. When it was discovered that he was a sorcerer, apart from making him a business ally, they often invited him to Loko to attend to their “spiritual” needs. Wal Atah would spent long periods preparing charms and amulets to as many as had needs. To them, he was strong physically, spiritually and a very reliable business partner who defended them against his own back in his home and other coaster tribes men. In the course of his numerous visits to his friends and clients, he decided to learn the trade of canoe construction. On Atah’s return home, he decided to settle where he could easily be located. Atah joined his neighbors located on the higher land around what is known today as sharp corner on Benue crescent area. This place was occupied by a part of the present Anguhar communities. The community was divided into three villages. One was located behind the present community secondary school; another was a little after the sharp corner on Benue crescent; and the other, at the location of the mosque on Kaduna street. His decision was premised on two reasons; one, there was a thick forest that contained larger trees (raw materials) that suited his new enterprise; and two, the community had learned fishing trade from the visiting fisher men from the upper Benue river, thus the availability of a ready market. There was fisher men from the upper Benue River; they were of the Wurukum, Jukun and Wadata tribes of the present Taraba state. Strands of Kabawa fisher men from the present Niger state. The three tribes from Taraba state and the Kabawas settled in the river’s islands for their job. They never at any time lay claim to land; always concede that they were fisher men. With time, Atah become proficient in the business of canoe construction, patronage became large and came from far and wide. Motley of people coming at unspecified times to place order for canoes from different communities became a little problem. The visitors had to eat and accommodated. And the demand on his host village was becoming too much for it to bear. While money was coming in, food was increasingly running short causing his host to become restive. He had to relocate or provide for himself and visitors an alternative to keep in business. A market had to be established. The communities were informed about the plan to establish a market, and leaders from Adaka, Uchen, Lobi, Adem and Anguhar assembled at Atah’s current resident. The location of the market, a place then populated by another part of the present Anguhar communities, where the mosque on Kaduna Street is sited was chosen. But the people here would not have any of that. They pointed out that, Wal Atah was not one of their own. As valid as that argument was, reason prevailed. Wal Atah who had travelled and was more experienced told his hosts that it was expedient for them to accept the idea of the market. He said it would help their community later. He stressed that, if his community was closer to the river, he would have not troubled them at all. The community accepted his superior position. In the dry season of that year, Atah was asked to provide a sacrifice for the opening of the market. Wal Atah gave his twenty-nine year old son. The market came in to being and was named after him- WALATAH and held on Saturdays. The Jukun and Wadata women would brew burukutu from the island and bring it over to the market in canoes every Sturdays. With time, a disagreement developed between them. The Jukuns who had accepted that they were fisher men and lives in the river agreed, the Tivs were owners of the land and their host. Any matter among them must therefore be taken to the Tivs for settlement. The elders of the five Tiv settlement sat in council and asked the Wadata tribe who were fewer in number to come over and settled on the coast by the market. The jukuns at the time fewer in number to the Wurukums, hated the idea of having the Wadata tribe, their business rivals, moved over to the market. they joined the Wurukums to Uuludu swamp on Gboko road, the area now known generally as Wurukum. 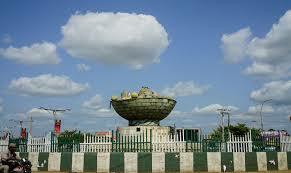 Their contention still rage as the place is both known as Wurukum and Agwuan Jukun. Wal Atah thrived and expanded to become a centre of commerce in the Benue province. The market’s fame travelled as far as the Cameroun Mountains to Keffi, down to Bassa Nge/ Bassakomo. The name of the market was heard far and wide for canoe and now, expanded to boat construction. Varied farm produce began to appear in the market in commercial quantity with a sustained regularity. This, no doubt, attracted the attention of the aristocratic minded with desires for feudalism. The controversy began in the pronouncement of the market name when in the 1900, Makudi was seen as a future economic potential. The fight to take over the town by the far sighted Hausa/Fulani group, already versed in organized society administration saw an ally in the Wadata people with whom they could associate by religion. When he came, Audu Dan Foda, a supposed Nupe man from Bida, who was imported to be the Sarkin Maku(r)di in the early 1900 (Tiv View magazine, Vol. 1. No. 1. March, 2017), was more at home with the market been named Wadata than Wal Atah (the Tivs appropriately call it Walata). And Wurukum, than Adem, Adaka or Lobi communities in whatever names they were known then. Thus began the endeavor of changing the town’s identity. Findings shows that, Audu Dan Foda was a descendant of an Islamic scholar who was forced on the Bida people in the Islamazation drive of the Sokoto caliphate back in the 17th and 18th century. He was not actually of Nupe stock as the Tivs were made to believe. The resentment would have been fiercer with the knowledge. But on assumption of office, even with his rejection by the people, Dan Foda quickly named the estern part of Makudi, waroumayo, after a herdsmen seasonal hang out (rugar). The herdsmsen used to hang around the Uuludu/Idye creeks during the dry season under the permission of the elders of the communities that formed Makudi. The activities of those whose wishes has remained to rob the Tivs of Makudi in name and resources, the land, their sources of livelihood thereof, thus obliterating the history of the town, its people of their originality and therefore identity as a people has continued to this day. What is urgently required is government intervention and directives to the state Urban Development to correct the anomaly by either renaming these places to reflect originality. Giving the aborigines of Makudi a sense of belonging for the sacrifice of their ancestral land, thus putting paid to such evil conceptions in the future against Tiv land in general.